I’m Robert Millar, owner and chief enthusiast at Tokyo’s only everything-in-English co-working space, Ginza Hub. 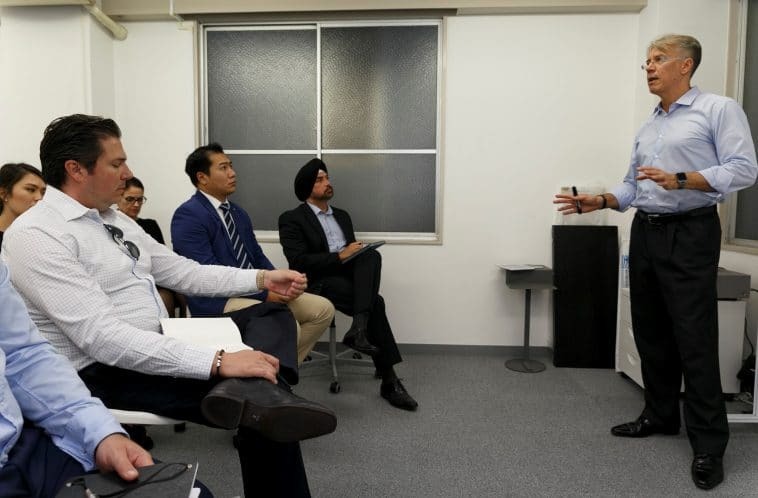 After 16 years as a consultant and 26 years working in Japan, my passion is now coaching startups on the tools and strategies needed to succeed here. You see, it’s tough launching a startup anywhere, especially in Japan, but if you equip yourself with proven basics, then there’s no reason you can’t enjoy the successes my clients and I enjoy as entrepreneurs in this fine land. Check out 4 of these proven basics below. This is where it all starts. The best ideas in the world, the most fantastic innovations imaginable, are all meaningless if they cannot define a problem worth solving. Well, for startups, cool doesn’t cut it. Because unless you’re a big brand like Apple or Google, people don’t buy cool. But if you can state the problem worth solving, and you can prove it by getting a bunch of potential customers to say that they’ll give you money for it, then you have a startup idea that can succeed! Obviously, you need to have either Japanese citizenship, or have a proper visa to to do business in Japan. If you have either of those, you can skip this section. Now first I need to make a disclaimer here – I’m not a visa lawyer, or public scrivener as they are called, and so can only give general advice, and it’s always best to verify information. Having said that, SMEJapan can assist with visa applications, and I myself have had several different types of visa during my 26+ years in Japan. The least complex and easiest to acquire of the 3 visa types here is the side-business visa or shikakugai kyoka, which literally means permission outside of qualification. Basically you can apply for this visa amendment to add your startup to your existing work permission as defined by your current visa status. The second visa type you could apply for is the self-sponsored visa or jiko shusai visa. This visa is a bit harder to get than the side-business visa add-on, and it does require more supporting documentation, but you can use it for full-time work, not just part-time. This visa allows you to shed the requirement for a sponsor for your existing visa and continue by yourself on that same visa. This is a godsend for company employees who want to leave their employer but can’t because their visa is pretty much attached to the job. And the third visa type I want to talk about here is the Investor/Business Manager visa or toushi keiei. This visa not only needs a ton of paperwork, including a detailed business plan with a financial forecast, but it also requires 5,000,000 yen, about 50,000 dollars, as starting capital for your business. Plus, you have to explain where you got the starting capital from and, if it’s a loan, how you intend to pay it back. The beauty of this visa, though, is that it gives you complete freedom to create and grow your startup, in the form of a stock company or kabushiki gaisha (or KK as they are better known), in any field you want without being encumbered by any need for sponsorship. I’m constantly amazed at the misconceptions I hear about registering a business in Japan. People are constantly held back by the myth that you have to incorporate a KK and that you need 1,000,000 yen, about 10,000 dollars, to do so. The method of registering your business in Japan that I most recommend is simply to register yourself with the tax office as a private contractor or kojin itaku. You fill out two 1-page forms, you copy them, and then you post them all off to the tax office with a stamped self-addressed envelope. The tax office will register your new business name, allocate it to you, and post you back a stamped copy of the registration. And that’s it! You’re in business. You may now legally hire yourself out to customers and invoice them for payment. The second method of registering a business in Japan is the Godo Kaisha or Limited Liability Company (better known as the GK.) The GK is much like the KK, providing limited liability protection to its shareholders, but it doesn’t require as much filing and is simpler to administer. Which leaves us with the venerable Kabushiki Kaisha (KK), or stock company. KKs do command a perception of prestige from the business community, so if you’re going to be dealing government departments, for example, this structure may open more doors for you. But the KK is more complex to set up and manage, so be mindful of the additional administrative costs of this structure. And finally, as with my advice about visas, I strongly recommend you get professional assistance when you register your business to maximise your chances of doing so properly. SMEJapan can handle this for you with no problems. This is easily the scariest but most exciting part of starting your own business – launching it! I’ve done this several times now, and helped many others do it too, and I want to say that in my experience the biggest obstacle to launching a business is falling into the trap of trying to get it all perfect before the launch. “Perfect” is in fact an illusion that many startups chase unnecessarily and for too long. It’s far better to launch early, gather meaningful feedback, then quickly adjust as necessary. This method is referred to as the Minimum Viable Product, or MVP. An MVP has just those features (and no more) that allow the product, or service, to be launched. The product or service is then typically released to a small group of potential customers. That is, early adopters who are thought to perhaps be more forgiving and more likely to give genuine feedback. It’s a strategy targeted at avoiding building products and services that customers won’t eventually want. This of course is all very well in theory, but it’s really hard to implement in reality. Startups understandably want to “put their best foot forward” and they work hard to get their product or service as good as they can before launching it. But the result is usually that the launch date gets pushed further and further away, and fatigue and demotivation start creeping in. And I see this all the time. It’s fear of being seen as having a product or service with insufficient functionality, or perhaps poor overall quality, that delays launches. But startups are much better off swallowing their pride and getting their MVP out to customers as early as possible. So consider carefully how you’ll get your MVP out and validate it with real customers. It’s not easy, but paying back a loan for a business that never even got off the ground is a lot harder. About the author: Robert is a startup expert who owns and operates Tokyo’s only everything-in-English co-working space, Ginza Hub. After 16 years as a consultant and 26 years working in Japan, his passion is now coaching small businesses on the tools and strategies needed to succeed. The content in this article was curated from his online course Start Your Own Business In Japan. Can you suggest a source to reach such an audience? Hi Carl, thanks very much for your question. I believe the best source to reach an audience of decision makers in Small/Medium Enterprise in Japan is via the LinkedIn platform. You can filter and search there to arrive at a list of target customers and simply message them there. Aside from that, I recommend you attend some of the various trade shows held in Tokyo around the industries you are interested in.